Within the DMARC Analyzer Suite it is possible to view forensic reports. The forensic messages are grouped based on the subject of the detailed message. Expanding the overview shows detailed results from these messages, including the feedback- and email headers. Users are able to identify invalid email flows a lot faster by using the forensic overview. The PGP setup allows encryption of incoming forensic messages. DMARC Analyzer supports and recommends a key size of 4096 bits with the RSA encryption algorithm. A client can upload a public PGP key in the DMARC Analyzer Suite to enable encryption. The client can generate a PGP key pair using online tools or client side libraries. Please refer to our article about forensic DMARC reports for more information about Forensic DMARC reports. 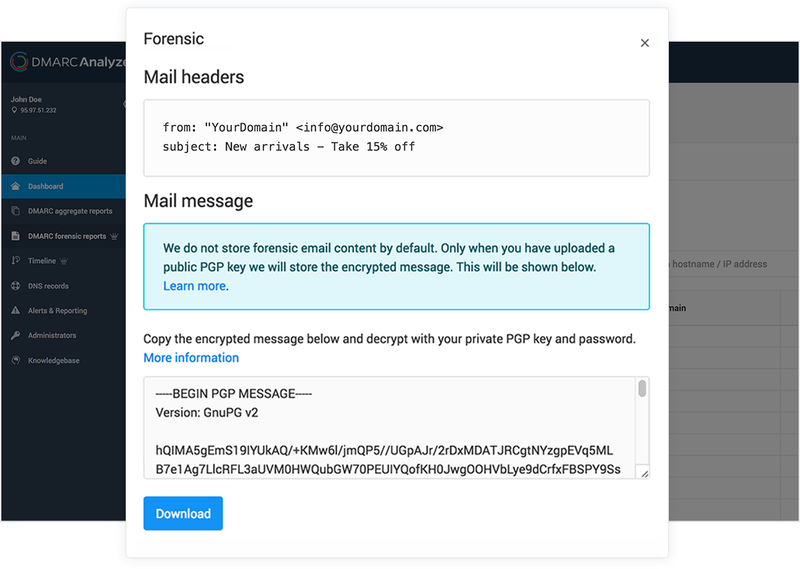 Refer to our article about how to setup PGP encryption for forensic reports for more information about how to setup PGP encryption within DMARC Analyzer.